There are many different species of Philodendrons, each possessing it's own characteristics as to leaf size, shape or coloring. Some species climb while others remain in more of a shrub shape. 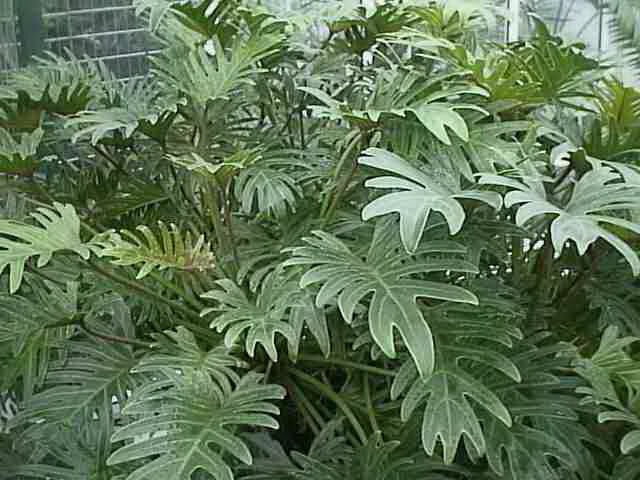 What Philodendrons all have in common is there ability to survive neglect and adverse conditions. On the other hand, direct sunlight will burn the foliage, and stunt the growth of the plant. Keep the soil evenly moist, but allow it to dry out between waterings. 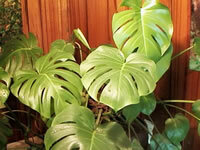 Keep Philodendrons slightly drier during the winter months, when the growth slows. Over watering will cause the leaves to turn yellow. Under watering will cause the leaves to turn brown and fall off. Feed your Philodendron in the spring and again in mid summer with a liquid house plant fertilizer. The ideal growing temperature is between 75 and 85 degrees F. during the day and in the 60's at night. Philodendron Plants will survive for a short time in temperatures as low as 36 degrees F.
Philodendrons grow best when their roots are slightly cramped, (but not too cramped), so don't plant them in a pot that is too large. When the roots begin to compact into a tight ball, the plant should be repotted into a planter that is 2-3 inches larger. Repotting should be done in late winter or spring, before the plant begins active new growth. Good drainage is essential, so if there are no drainage holes, be sure to fill the bottom of the pot with clean stones or broken crockery. Use a good commercial potting soil or a mixture consisting of equal parts of loam, sand and peat moss, with some chopped charcoal, gravel, broken crocks or brick added. Newly potted plants need to be carefully watered during the first month or so, to be certain that the roots don't dry out completely. Never allow the soil to become saturated or soggy. 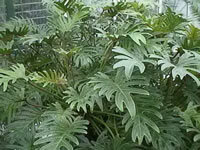 It's especially helpful to mist the leaves of newly planted Philodendrons two or three times a day. It is also a good idea to add a moss stake or other type of pole to the planter at the time of repotting if this is a climbing or vining type of Philodendron. As the plant grows, it will need some sort of support. The are several types of plant poles available at garden centers. Some types of Philodendrons produce aerial roots which will cling to whatever support they find. These roots should never be cut off completely, but they can be trimmed back if they become too long, or begin to die back. It is far better to attach these roots to the support pole, or lead them back to the pot where they can grow into the soil. or by offsets removed from the parent plant. Pieces of stem that contain at least two joints can be inserted as cuttings in pots of sandy soil or in a mixture of sand and peat moss. The pots should be kept at 70-75 degrees F., and shaded from direct sun until they are well rooted. Trailing varieties will often root at any point where the stem comes in contact with the soil. Pin the stem securely onto the soil in a separate pot with a hairpin or a bent piece of wire. It will be rooted in 4-8 weeks, at which time you can sever the new plant from the parent. Offsets are new plants that emerge from the base of the plant or from the roots themselves. by cutting it off with a sharp clean knife. Philodendrons can also be grown from seed, but this is a long, slow process to get a specimen sized plant. The seeds must be kept moist and at a temperature of 75-80 degrees F. for germination, which take from 15 to 30 days.